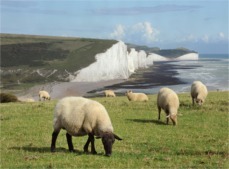 Sheep have an immensely important history throughout Britain and have been domesticated and bred for thousands of years. The wool trade was the principal source of England's wealth in the Middle Ages and Lavenham, one of Suffolk's wool towns, was the 14th wealthiest town in those days. Wool exports to the Flemish weavers were one cause of The Hundred Years War. The English Enclosures and the later Highland Clearances were as a result of the profitability of the wool trade. In those days sheep were bred for their wool, now it is for their meat. Wool, a fibre of such quality that nothing man-made comes close, is now so cheap that it costs more to shear an animal than the £1 or so a fleece is worth today. One is tempted to ask what exactly the Wool Marketing Board has been doing since it was spun off by MAFF in 1950. There are 80 or so breeds of sheep and the choice should be governed by their suitability for a given region or topography (lowland breeds do not do well in upland regions), hardiness, fecundity, longevity and the preferences of the market. Fashions come and go and breeds wax and wane. When deciding on a breed the advice should always be "do your own research". It was very difficult to replace the hefted flocks from the unfenced uplands lost to Foot and Mouth disease and imported breeds often show an Achilles Heel when brought over the Channel; some breeds make poor mothers. As with all other ruminants, sheep do much better on swards containing multiple grass species and on soils that can provide all the minerals and nutrients they require. A sheep’s rumen operates on a much faster turnover than that of a cow and the animal is much quicker to exhibit deficiencies. This has given rise to the old saw that a sheep's only purpose in life is to find a new and original way to die. Over the years our experience with sheep has helped many farmers to improve fertility and lambing percentages, whilst reducing disease, neo-natal death rates, time to maturity and usage of creep feed. These factors alone have a big influence on profit. What it adds up to is that we allow sheep to achieve their genetic potential. It makes no financial sense to run a flock of sheep with a to-market lambing percentage of 140% when the potential is 190%. The overheads are much the same, so the extra 50% is mostly profit!